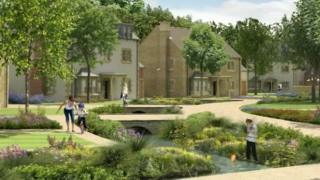 More than 2,000 new homes are likely to be built on green belt land outside a small town despite fierce opposition. Northumberland County Council granted "outline" planning permission for a garden village near Darras Hall, Ponteland, approving it in principle. Residents argue the large number of homes will swamp local roads, schools and other infrastructure. Developer Lugano Property Group said there had been a "major misconception" among opponents. Richard Robson from the company said: "This isn't a housing estate tagged on the side of Ponteland and Darras Hall. "This is an entirely new village, separate, surrounded by it's own landscaped green belt; it's a new community in its own right." It would have its own school, shops and leisure facilities, he said. A separate 400-home development near Cheviot View has also been given outline permission. Residents said the two schemes would double the town's population. Leslie Noble, from Ponteland town council, said they "haven't been listened to by Northumberland County Council because they have a predetermined plan". Resident Christine Caisley said she was considering moving. "It's not going to remain the green, desirable, peaceful place we bought into in the first place; it's going to be spoilt, if not ruined," she said. Council Labour leader Grant Davey said the development "would bring 500 affordable homes into an area where we have no affordable homes at present". Added benefits would include a bypass and flood defences, he said. However, council Conservative leader Peter Jackson said there was "no need" to build on the green belt. "We have enough space already that was brown fields sites and infill sites to satisfy the need that we have," he said. The National Planning Casework Unit will either confirm the council's decision or pass it to the secretary of state.